A ten-person delegation representing Door County is scheduled to visit the county’s Sister City of Jingdezhen, China in mid-October 2013. The delegation will be attending the China Jingdezhen International Ceramic Fair, meeting with local officials and seeking ways in which to increase both cultural and business exchanges between the two municipalities. Door County has had a Sister City relationship with the City of Jingdezhen since May 2004, when the Door County Board of Supervisors adopted a resolution endorsing the arrangement. The relationship was further cemented when the County adopted a Sister City Project Agreement in 2005 and signed a Friendship City Relationship Agreement in 2010. Over the nine year period of the Sister City Program, activities have focused on mutual communications of good will and delegate travel exchanges by representatives of the town governments. Most recently, in May 2010, an eight member delegation from Jingdezhen visited Door County. Following the May 2010 visit by the Jingdezhen delegation, County Board Chairman Dan Austad appointed Bill Schuster, County Soil and Water Conservation Director, and Bill Chaudoir, Executive Director of the Door County Economic Development Corporation, to lead an informal advisory group to assess and consider the future of the Sister City relationship with Jingdezhen. Chairman Austad noted that Jingdezhen officials had extended an invitation for a delegation from Door County to visit China. The advisory group met a few times and found that the Sister City program indeed had value and should be embraced and promoted for broader local participation. For more than 2,000 years, Jingdezhen has been known as the porcelain capital of the world. The city, in China’s eastern Jiangxi Province, began making porcelain as early as 200 B.C. Today, Jingdezhen remains a national center for porcelain production. Among those joining Schuster and Chaudoir in the China delegation are former Door County Board Chairman Charlie Most; John Dietrich and Diane McNeil of Ellison Bay Pottery; retired Sevastopol teacher Mike Madden; Sonja Schuster; Cheryl Chaudoir; and Kent and Virginia Kruse. Read documents related to the Door County-Jingdezhen Sister City relationship. Door County Board of Supervisors Chair Leo Zipperer signs the Sister City agreement with the Honorable Huang Kangming, Vice Mayor of Jingdezhen City, June 2010. 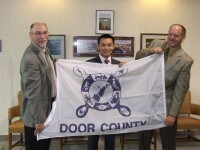 DCEDC's Bill Chaudoir, Yanjun Weng from Jingdezhen, China, and Door County Board of Supervisors Chairman Charlie Most, October 2007.